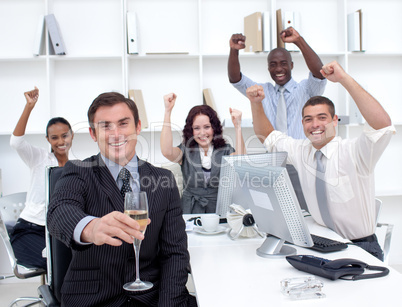 Royalty free photo Successful businessteam driking champagne in office with a maximum resolution of 4271 x 3262 pixels. The image Successful businessteam driking champagne in office is one of 23697 photos in the category Menschen and has been part of ClipDealer's stock since 15 Oct 2009 10:08:30. Successful businessteam driking champagne in office is released for Kommerzielle und redaktionelle Nutzung.